In Week 2 of our Crime and Punishment month, we’re looking into the lives and times of Victorian and Georgian gangs in Britain and Ireland. We’ve found some fascinating - and seriously daring - examples of the organised criminal underworld in this period in our records. In Dublin, there were several criminal gangs who repeatedly made the headlines, mainly because of their wanton violence. In Georgian & Victorian Dublin, two main criminal gangs ruled the streets. 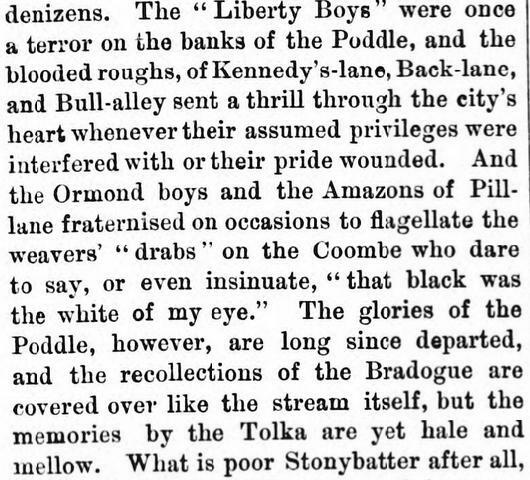 The Liberty Boys (protestant weavers from the northern side of Dublin) and the Ormond Boys (catholic butchers from the south), despised each other so much that street fights between their members was almost a daily occurrence in the 1700s. 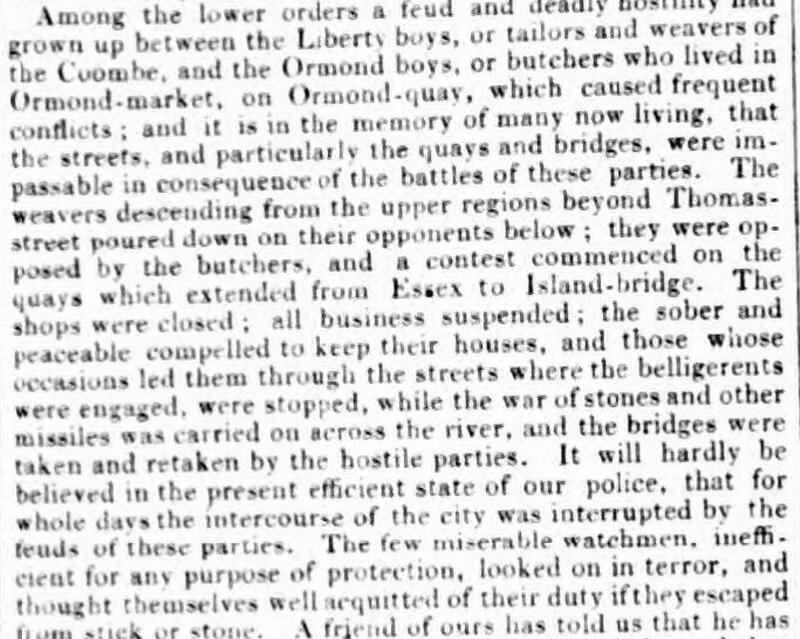 One of these riots in 1790 was so serious that it shut the entire city off to commerce for 2 whole days! The press gave many reasons for the animosity between the two gangs, although the real reason may be lost into the mists of historical inquiry (if you know more, please share in our comments section!). In any case, the quarrel appears to have been an old one. 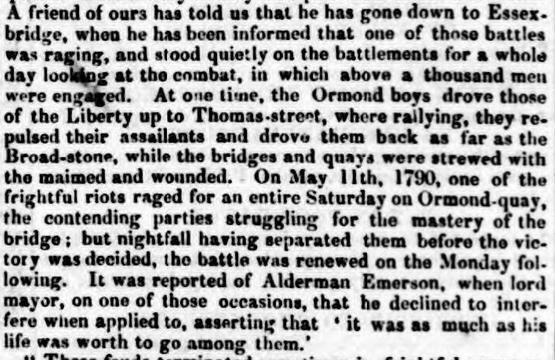 The earliest report of rioting between the Liberty Boys and the Ormond Boys in our newspaper collection is dated 1749, which meant the feud was certainly an old one to still be worth fighting over in 1790. As other reports show, the animosity between the gangs was real, extensive and very violent! As this newspaper from 1764 points out, serious wounds were often inflicted on rival gang members as they brawled for control of the Dublin streets. A newspaper reporting on an academic analysis of the events 90 years on carries more details about how the gangs armed themselves and how big the riots sometimes were, with a specific mention of the massive 1790 riot that raged for two days, despite the intervention of the local alderman and militia! As the newspaper continues to write, the watchmen employed to keep the King’s Peace (in 1790 there were no established police forces anywhere in the world) were unable to act to prevent the violence, and at one point were forced to retreat into their duty station to escape the marauding gangs. However, as all criminal movements wax and wane, the animosity appears to have petered out at some point in the early 19th century. A retrospective article written on the gang violence ‘some years ago’ pointed out that either the police had become effective enough to nip the violence in the bud, or there simply weren’t enough weavers and butchers to continue the feud. Both Freeman’s Journal and The Dublin Builder carry articles in the late 19th century remarking on the change in Dublin’s waterfront community following the end of the feuds. 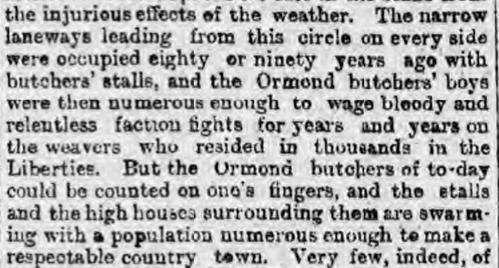 Was your Ancestor an Ormond Boy or a Liberty Boy? Were they involved in the great riot of 1790? We’d love to find out. Share your stories in the comments below.